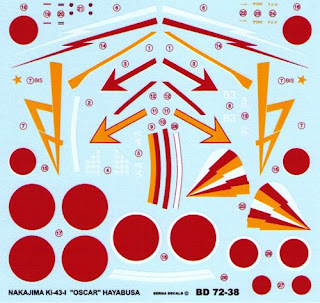 When I saw the new Berna Decals for the Hayabusa I thought the 47th Sentai insignia on the 1/72nd sheet looked a bit large - in fact the same size as the one on the 1/48th sheet ! Have no fear, having examined an actual set there is an addendum sheet included in the 1/72nd set with the 47th Insignia to the correct size. That's good, because this option is an interesting one, an early Hayabusa in much worn dark green paint with Home Defence bands and colourful fuselage stripes. Please note though that there are not sufficient Hinomaru in the set to do all the options, in fact there are not enough wing Hinomaru to do even two options. My example sheet has thin, glossy decals with good colour saturation but as with all such decals it remains to be seen how they hold up when applied over dark paint. The variegation on the Hinomaru apparent in the image shown here is not present on the actual decals which have consistent and rich colour. The instructions suggests either FS 34102 or 34036 for the green paint on all the options, presumably meant to represent # 21 "midori iro" and # 27 "ao midori iro" respectively. This is somewhat at odds with the artifact evidence presented here and here but I don't know how these FS values were arrived at. Recent evidence suggests that these two paint colours were used haphazardly on the early Hayabusa and even together on some airframes to emulate the Luftwaffe-type camouflage. (More on Hayabusa colour and camouflage in my forthcoming guide which has had to be split into separate Ki-43-I, II and III volumes because of the amount of data to be included therein). One of the minor mysteries of the JAAF and one which continues to confuse modellers is the factory vs "field" finish. Whilst Kawasaki's Ki-45 Toryu (a fighter) and Ki-48 (a bomber) left the factory in overall camouflage finishes with a painted base coat on all surfaces, the Ki-61 Hien was (predominantly) shipped in bare metal. Most of Nakajima's products left the factory in bare metal, whilst Mitsubishi's were mostly fully painted. Why? As far as I know, no satisfactory explanation for these inconsistencies has emerged. Recently I was sent photos of a Ki-48 model finished in green mottle over bare metal, a typical depot-style "field" finish. 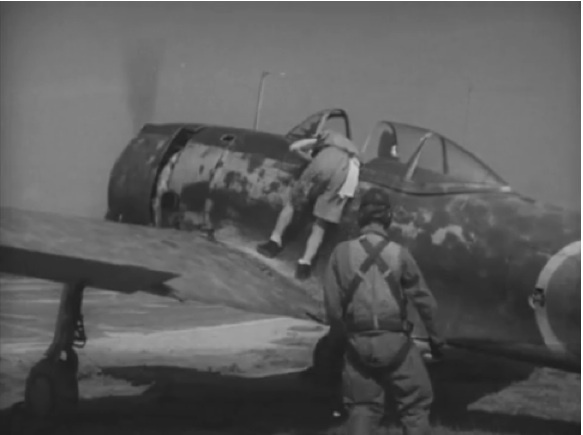 Of course it is impossible to rule out the possibility that some Ki-48 appeared this way but it just looked odd. We are used to seeing this aircraft with the camouflage mottles applied over a painted base colour and the available photographs support this. But bearing in mind the typical mid-war finish of the Ki-43 and Ki-61 the choice is perhaps understandable, especially by someone confronted with the subject for the first time. I think the origin of this confusion lies in the fact that it is sometimes very difficult to discern a badly oxidised natural metal surface from a grey-painted surface in old photographs and also that some types - the Ki-43 for example - sported both variants with mottles applied over the bare metal (usually) but also over a painted base coat (sometimes). In the latter case a further complexity arises as to whether the painted base coat was applied overall or only on the upper surfaces, leaving the underside in bare metal (or a different colour paint). In some cases the mottles were sprayed so densely as to give the impression of a base coat and/or of two separate colours. It is a brave man who can resolve these questions definitively just by examining photographs. The Revell Ki-45 Toryu instructions (from 1972) suggested painting a dark green mottle over "silver" and one still sometimes sees Ki-45 models finished that way - but again it looks odd. The subject of these green mottles over natural metal (or base colours) warrants further exploration and, as with so much to do with Japanese aircraft, the devil is in the detail. The patterns and application methods were incredibly varied (even on the same aircraft) but this seems to be rarely represented on models. Some of the patterns depicted on models (and in artwork which modellers then copy) are just too regular, too stylised and too contrived. They reflect more the airbrush skill of the builder or painter rather than any connection to the real Japanese aircraft. Sometimes it seems that the modellers have got as far as "airbrush + dark green paint + "mottle"" without going further than that. I suspect that often as they paint the "pattern" is in their mind's eye rather than referenced closely to any photograph. The result of this is usually an impression rather than a replication of the real thing. And the airbrush is not always the best method to replicate all the styles and applications to be seen in photographs. Another aspect is wear and tear. JAAF finishes especially could deteriorate to the degree that an originally overall colour was reduced to a quasi-mottle appearance and some such worn finishes were then touched up with applications of mottle (and vice versa), very often on selected parts of the airframe rather than all of it. Airframes often give the appearance of being partially painted by different people at different times - as indeed they probably were. On single engined fighters particularly the mottle finish was often densest on the wing upper surfaces and sparse at the wing roots and sides of the cockpit. Whether this was just the result of wear, deliberate or an application dictated by circumstance is sometimes difficult to determine. Again, one seldom sees these finishes replicated on models. This is all the more surprising since the motivation of so many modellers in the face of so much internet image overload is to build and create something different! But one of the hardest things to achieve in modelling is to deliberately paint in a way that appears random or improvised. Great posting. Liked the photos. Thanks for todays addition to your site and especially for those photos. In the third photo, is the cover missing from the escape? hatch or just raised? A particularly apt final sentence from you in consideration of what I'd planned for my next modelling project! I could not agree more with that last sentance. In painting it is definitly hard to contrive to make something look random! A thoughtful provoking and informative posting. Pat D.
This is a frame from a film (Kato Hayabusa Sentotai 1944) and the cover is missing. After warmly patting the groundcrewman on the back the pilot climbs in to taxi out. Coincidentally, after examining the frames from this film, I noticed the cover missing on a few other images of operational Hayabusa.